I have been memory keeping for over 15 years now (omg – that makes me feel so old!) but anyone who knows me at all can tell you that Art Journaling is my first love. It has helped me through some pretty tough years and I have come to really believe in the healing powers of the artistic process. Whether it is the calm stability brought on by sitting down to scrap a page at the end of a crazy day, or really hashing through some tough emotions in a messy journal page, the artistic process really does reach into the core of our being. It helps us to get in touch with our deepest parts. I have spent a lot of time chatting in forums and clicking through galleries, and one thing I see over and over is that a great number of people really like the idea of art journaling, but they either lack the confidence to jump in, or have no idea how to get started. Willemijne and I have decided to do something about that. Art Journaling for Beginners is going to be all about simple tips and inspiration to help you make art journaling pages you love, after all, that is really what it is all about anyway. I don’t know why, but that makes me all giddy inside. Isn’t that what memory keeping is all about? I think it is pretty safe to say that Art Journaling would be a “Visual record of news and events of a personal nature.” There is no “it must look like this” attached to that, because let’s face it, each of us has a very different life going on, and so our journals will mirror those differences. 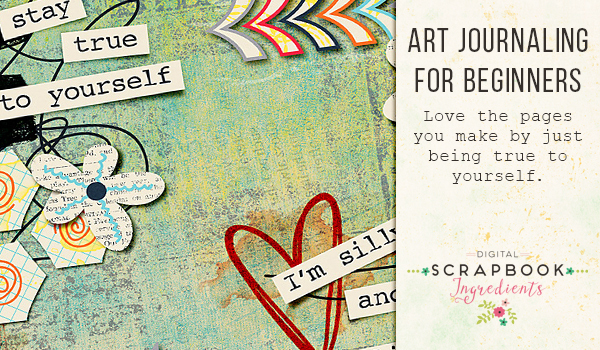 To me, that means that Art Journal pages should reflect the person who is creating them. If you are a minimalist person, then your AJ pages can look minimalist too if you like! Sometimes a minimalist will go CRAZY in AJ and do things they would never do anywhere else, but it is not a requirement. Some of my favorite AJ pages are very simple and minimal, and yet, I am not a minimalist person at all. If you have never heard it before, there is only one rule in Art Journaling: THERE ARE NO RULES! It seems simple, but it can be confusing to a lot of people. I know, some of you are saying, “You say there are no rules, but if I just throw everything on the page it looks horrible. Surely you are following some guidelines to get your pages to look the way you want.” Well, subconsciously yes. There are the basic principles of design that come into play – balance, harmony, movement etc. If you want to know more about these look here or check out the Blog over at The Digital Press. The CT often covers some of these in their weekly posts. Often it is even simpler than that, I just grab something I like, an element, a particular paper or word art, and start playing. Not having to think about it but just have fun is one of the things I most enjoy about art journaling. If I don’t like something I get rid of it. It is as easy as that. Art Journaling is about me, and what I like, and if no one else likes it, then, oh well, no big deal. So for today, I want you to really think about what you like and who you are, and try and make an Art Journal page just for you. A page that really shows you and your inner self. 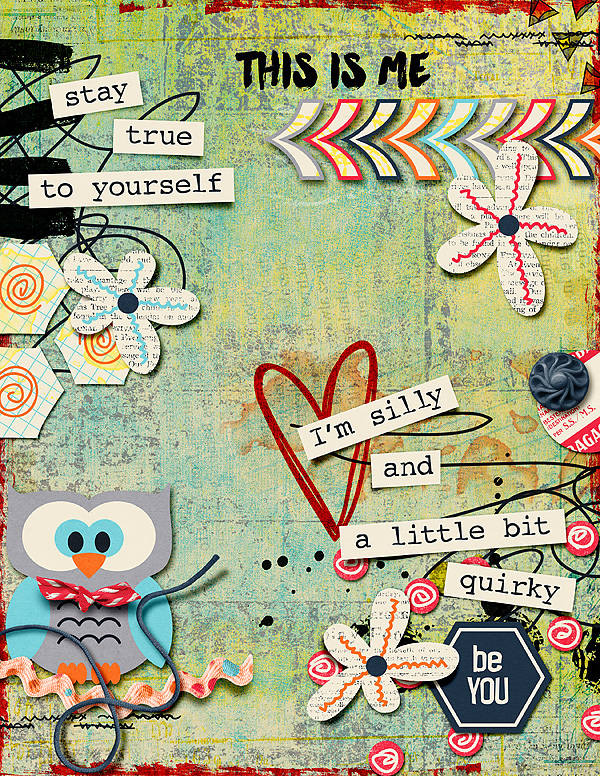 When I first saw the “A Little Bit Quirky” Collection, I literally squealed out loud. I loved it that much! It just feels like me, and it goes along with what we have been talking about today so I had to play with it. Here is a page I made and it was SO much fun to just play! Now it is your turn. I would love to see what you make, so please come back and link us up in the comments. And to make it even more fun, we’re giving away a $10 Gift Certificate to the DSI store to one randomly chosen winner. How exciting is that? Just use 50% DSI products on your page, upload it to the DSI gallery at The Digital Press and link us up in the comments here before the end of March! Got a question burning in your mind? Have a topic or technique you want addressed? Feel free to let us know in the comments and we will do whatever we can to find an answer.